With the holidays comes family, fun, and gifts! 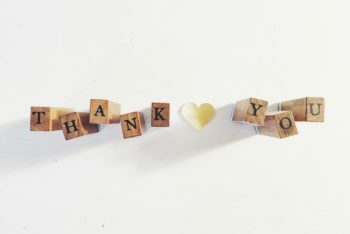 There’s no better time of year to each a child (and adults) the importance of gratitude beyond the “Thank you” that comes after receiving a gift. Daily gratitude is such a simple idea/process, yet most people overlook it’s amazing benefits. Dr. David Hamilton, author of Why Kindness is Good for You, writes, “Gratitude is a mark of being kind to life by being aware of all that is around us, and when we are grateful, we acknowledge the people and situations in our life and express thanks for them.” We teach our children to say “thank you,” but it’s also important to model and teach them to see gratitude as a key philosophy of life. Seeing and feeling gratitude every day is one key to being resilient and successful. There is quite a bit of research on gratitude and it’s positive effects. These positive effects make sense because when you think about what you feel grateful for, you can’t help but feel relaxed, fulfilled, and blessed. Gratitude even improves relationships. Research shows that saying thank you to someone helps to create a more positive relationship. When a child feels gratitude from his or her parents for being helpful or for just being a good kid, the child feels safer and more empowered to say something when they are upset and need to talk. It is fairly easy to teach kids to practice a life philosophy of gratitude. Using the 30-day Imagine, Gratitude, and Kindness Challenge (Step 7 in My Imagine Journal) is a good place to start—especially during the holidays. Kids can have fun creating a family gratitude board or a gratitude box where everyone can write, keep, and even share what they feel grateful for anytime of year. We play The Gratitude Game in the car or at meal- time. Particularly if someone has had a bad day, this can help them put their experiences in perspective and feel better. Each person takes a turn saying what they are grateful for, beginning with, “I am grateful for…”. We can be grateful for anything in life, even our pillows or phones, waking up on the more or just life in general! Everyone takes at least three turns. By the 3rdturn you should see and feel more positivity in the air! If someone is unhappy about something, it may help to first clear the air by letting them talk about what’s upsetting them, while others listen with compassion. After they’ve had their say, feel more relaxed, and are ready to change perspective, switch it to gratitude, and watch moods brighten. If someone wants to remain cranky, it might feel like pulling teeth to get them to join the game, but be patient and gently invite them to join when they feel ready. They may be content to listen—and benefit from it—especially if they know it’s not being done to manipulate their mood. Even if they continue to resist, simply let them be, and honor their desire to come around in their own time, on their own terms. Even before the gifts begin to open, it’s so important to teach a child to find gratitude in every day. Begin each morning by taking turns saying what everyone is grateful for; end each day with the same practice; both are life long practices that positively change brain function and will improve anyone’s outlook on life. It’s with my deepest gratitude and love for believing in The Imagine Project, Inc.